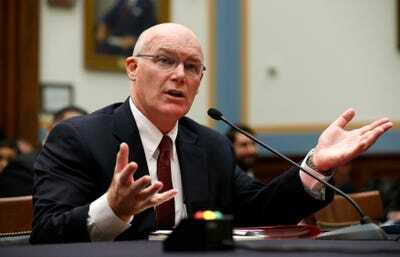 Kevin Lamarque/ReutersActing Secret Service Director Joseph Clancy testifies before a House Judiciary Committee hearing on ‘Oversight of the United States Secret Service’ on Capitol Hill in Washington on Nov. 19, 2014. Clancy came out of retirement after Director Julia Pierson resigned following a high profile security lapse at the White House. The acting head of the U.S. Secret Service said on Wednesday that the agency charged with protecting the president had been “severely damaged” by harmful lapses, including allowing a knife-carrying man to jump a fence and run into the White Housein September. Joseph Clancy told the House of Representatives Judiciary Committee he had sought to establish a culture of trust within the Secret Service since replacing Julia Pierson, who resigned under fire as director on Oct. 1. A lack of trust had driven some employees to take concerns about internal problems to people outside the Secret Service rather than trusting their supervisors and the agency leadership to confront issues head-on, Clancy said. An internal review released last week found that an intruder was able to scale the White House fence and enter the main floor of the building on Sept. 19 because of major Secret Service failures, including an agent distracted by a personal mobile phone call. The incident involving Iraq war veteran Omar Gonzalez was one of the worst security breaches since President Barack Obama took office in 2009. “Without question, the agency has been severely damaged in recent years by failures ranging from disgraceful misconduct on the part of some employees to operational breakdowns that undermine the trust and confidence that previous generations worked so hard to establish,” Clancy testified. “Although I firmly believe that the Secret Service is better than this incident, I openly acknowledge that a failure of this magnitude – especially in light of other recent incidents – requires immediate action and longer-term reform,” Clancy added. Committee Chairman Bob Goodlatte, a Virginia Republican, said incidents including the Gonzalez one “give me great concern that the policies, procedures and training at the Secret Service are not entirely up to the task. “Others include the Columbian prostitution scandal, the recent ability of a security guard with a criminal history to take a service weapon into an elevator with the president and the incident in the Netherlands dealing with intoxicated Secret Service agents,” Goodlatte added.